For such a small country, the Netherlands has a wild range of dialects. Not even that far removed from my home, the band Asgrauw at times sounds very alien to me as the titles and idiom offer exciting, unknown ideas on this album ‘Gronspech’. Featuring a foreboding vista of the Dutch countryside in oil painting as cover, an album that shows its roots proudly. Asgrauw translates as ‘the color of ash’, but also refers to the scythe-shaped shining of the moon. The bass and guitar are handled by Kaos and Vaal, who added Batr to the line-up in 2012, who played in Sagenland and Meslamtaea amongst others in the past. 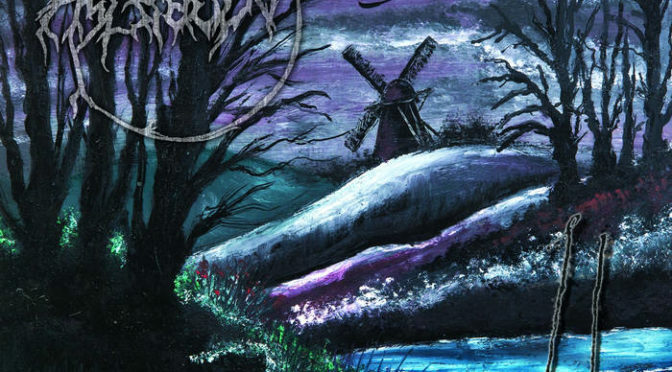 Bands that explored the same mysteries of the past from regional sources in their Scandinavian-inspired black metal. It’s not the music that sounds refreshing thus, as it is the standard fare of tremolo riffs, ripping guitar salvos and blast beats that rock your desk chair. Still, by implementing some of that Immortal epicness, the sound catches on quickly and easily gets you involved on tunes like ‘Wolvenbloed’, which has a bit of a rock’n’roll groove when the murky atmosphere fades for a moment here and there. At times a punk feeling shines through in the sound, as the buzzsaw guitars just keep growling and the screamed vocals take on a pitch of frustration and shouts defiance at the listener on ‘Duitenpact’. At times the waters seem to grow calm, but the next outburst of hateful fury is always lurking around the corner. If ever needed, the synths provide an additional layer of atmosphere to their sound. Asgrauw might be the thing you should check if you dig the more pungent, visceral black metal with maybe a hint of Haïve and Vreid.